This book was previously published in 2002 as a hardcover edition. The paperback I have is the 2008 edition. John Raynes is an artist and teacher. I like the style of his art, particularly the sketches and watercolour. He has written other books including Complete Anatomy And Figure Drawing, The Complete Watercolour Course and The Complete Guide to Perspective. 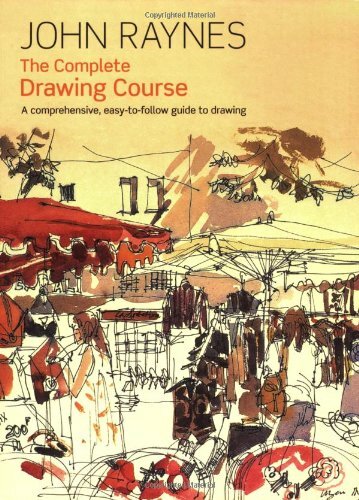 The Complete Drawing Course covers the basics of drawing based on observation. There are chapters on the basics like looking at shapes, form and volume, perspective, composition, light and texture. The text comes with plenty of illustrated examples. The chapters on fundamentals are rather short though and can really use more elaboration to help readers understand the effectiveness of the techniques. The second part of the book features many drawing projects that use mediums such as pen & ink, pastel, charcoal, colour pencils and watercolour. The subjects are rather complicated but not so daunting as there are step-by-step pictures to follow along. They are helpful exercises to help one get comfortable with drawing. The instructions are always insightful.